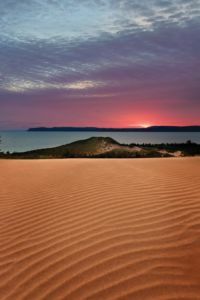 Get the Sleeping Bear Dunes gift package! There are lots of ways to access the Dune Plateau, but the easiest way we’ve found is to take the Cottonwood Trail. As you start walking, you sort of instinctively start looking for a place to cut off to the west to get to the lake. You quickly realize, though, that any way you go, you have to go up a really steep dune, so eventually, you just pick one of multiple social trails that cut into the plateau. The more you walk, the more you start to question whether you’re going the right way. Every time you get to the top of a dune, you think you’ll be able to see the lake. But, no—there are more and more dunes, for at least a mile. Eventually you’ll get to the top of one, though, and the dunes just immediately stop. 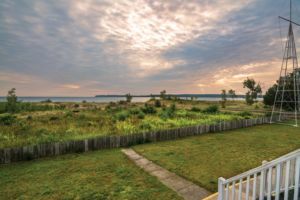 And you’ll see the sweeping vast views of the lake, the blue, blue water and one of the closest views of the Manitou Islands from the mainland. And it can be ridiculously windy. We actually started going out to this spot only because we were on the hunt for a piping plover nest. We kept seeing these two birds on the beach below the Dune Plateau, but then they’d disappear. We had a hunch that maybe they were nesting way up at the top of the cliff, which would be really unusual because the birds typically nest on the shore. So we hiked out into the plateau, looking for the nest, which was pretty much like trying to pick a needle out of a haystack: The nests are just these tiny cups of sand, and the eggs look like rocks. But we just wandered around up there, and at one point, we heard a very faint piping plover cheeping noise. I remember getting goose bumps; I was so excited that we were onto them. So we followed the birds, and they led us to this tiny little nest in the sand that was in about 200 feet from the cliff. We still don’t know how they got their chicks down to the shore. We sort of imagine they gently shoved them off the cliff and they rolled down to the beach. Being up here is a reminder that there are so many areas in the park to explore. People tend to go to the known tourist spots, but there are miles and miles of shoreline that people never go to. There are acres of forests that you can go and wander in if you want. There’s something really exciting about going to a spot that not many people go to—knowing you’ve seen a side of Sleeping Bear that hardly anyone sees. Getting there: From M109, travel to the north end of the Pierce Stocking Scenic Drive Loop and look for signs for the Cottonwood Trail. This is not a secret spot, but it’s a great spot—especially for families. The whole north end of the lake is a nice sandy beach, but one of the cool things is that as you walk along the north side, you’ll see Lake Michigan is just across from it. 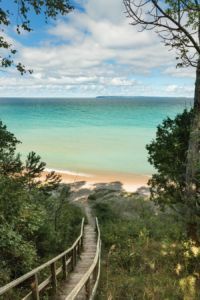 In fact, there’s actually a little outlet that connects North Bar Lake to Lake Michigan, and that is super fun for kids. I’ve seen it when it’s just a little trickle that’s only two or three inches deep that kids are skimboarding on; or I’ve seen it where it’s three feet deep and 20 feet across. So it’s a little different every time you go. The appeal of an inland lake is it’s great for smaller kids. The big lake can get some waves on it, and even a two-footer can be intimidating. North Bar has a little bit of a shelf, and it has shallow water to play in. So you can go there any day, and if it’s windy and the waves are big on the big lake, you can play in North Bar. And if it’s a nice calm day, you can play in both. And the same thing with water-temperature: If it’s too cold in the big lake, the kids can run back and play in the relatively warmer waters of North Bar. One of the other cool things is the sandy part is just the north quarter of the lake. That’s where the families and swimmers are, but a lot of people will walk or paddle the shore in a kayak. It’s also great fishing. And if you go down to the other end of the lake, you can still get that feeling that you’re all by yourself. So entire families go down there, and a couple of the older kids will go fishing, while the younger kids play in the water. It’s really got a little something for everyone. Getting there: From M22, turn west on Voice Road, then north on North Bar Lake Road. In the summer, I ran the beach monitoring program—It was my job to make sure there wasn’t too much bacteria in the water and it was safe for swimmers. When you’re there every single week, you get to know the sampling areas pretty well, and Shalda Creek was one of the sampling spots that we added a little later in the summer. One of the reasons it’s become a favorite is you get to see a lot of ecosystems packed into a small area. From the parking area, you take the trail through this beautiful forest that has maples, birch and hemlock, and then you’ll come up on this stream. A lot of times, I would see blue herons at that spot. And since the water is only about knee-deep, you can actually wade right across, and there are all these bright orange and yellow native wood lilies all around you. Once you cross the stream, the area opens up into this beautiful sandy beach area, where you can see a good chunk of Good Harbor Bay. When I’m out there at 8 in the morning, I have the beach to myself. But when I’ve driven by during the afternoon, it’s been pretty bumpin’. You know, Sleeping Bear is one of those parks that people visit again and again, and this is clearly some people’s “secret spot.” And as far as water quality goes, Shalda Creek didn’t exceed safe levels once last year, which is good for swimmers—and for me, because you never like kicking people off the beach. Getting there: M22 to Bohemian Rd., turn north to Lake Michigan Rd. West on Lake Michigan Rd. 3/4 mile to the creek. If you take the road in about two miles, you’ll come to this opening where you can park. You’ll see a gate there; you can’t go past the gate in a vehicle, but that driveway will lead you to an old house that used to belong to one of the families that lived here. Out front, it has this neat little pond, and the whole area is kind of wet and boggy. If you looked at it from above, it would look almost like a maze because it’s basically a bunch of strips of water interrupted by strips of land. This makes it a great spot to go hiking off-trail, because you can just kind of navigate your way through on those higher strips of land. It’s a pretty secluded area, too, so it’s a great spot to look for wildlife. I’ve seen coyote and bobcat tracks, and I’ve run into locals out there that say people have seen mountain lions in the area. Probably one of my most memorable experiences out here was when I was hiking through the boggy areas—off-trail—and I stumbled on a sandhill crane. I didn’t even see him until the last second, and he made that really loud sound that sandhill cranes make: It’s this very unique, guttural, throaty sound, and when you’re that close, it almost shakes in your chest. Once you’ve explored that area, there’s also a trail right behind the house, and it’s just another half-mile to get down to the lakeshore. Very few people are going to go to all that trouble to get to the lake, so there’s a good chance you’ll have the place to yourself. Getting there: From M22, turn north onto Boekeloo Road. 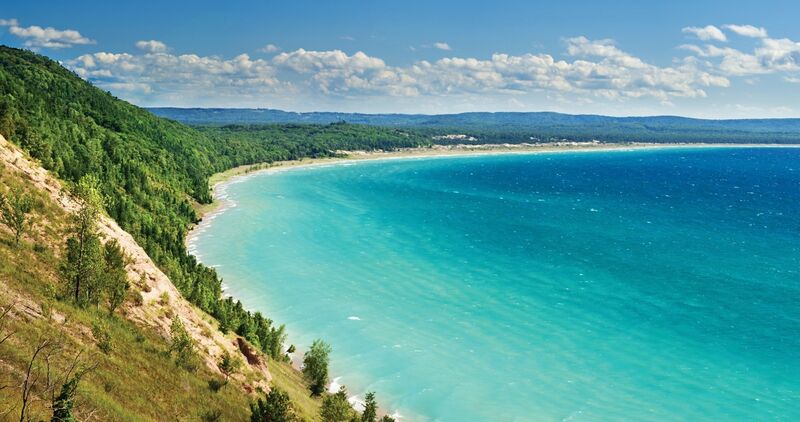 Everyone who comes to Sleeping Bear understands the natural beauty of the area, but there’s also a lot of history. The building that’s now the Maritime Museum, was a U.S. lifesaving station 100 years ago. It actually used to be a mile west of where it is currently, but they had to relocate it because of the encroaching sand dune. Back when it was the life-saving station, the people that worked here performed rescues for ships that got into trouble on Lake Michigan. You can imagine how difficult this was without the kind of technology we have today. Crew members would patrol the shore at night during stormy times and watch for ships in distress. And every day at the site of the Maritime Museum, you can actually watch a reenactment of how the life-saving crew would have saved a ship. The building itself has a simple porch, but I’ve found it’s a great spot to look over Lake Michigan. It’s not the kind of view you get from high up on the dunes, but you can see the horizon and the water and it’s just such a peaceful view. And, of course, it’s a great spot to put yourself in the shoes of the people who would have been there 100 years ago. Getting there: From Glen Haven, follow Sleeping Bear Dunes Rd. west 1/2 mile. I’ve been here about five years, so I’ve been trying to do every single hike in the park. The Park Service actually has this little brochure that you can check off if you do them all in one year. I haven’t done that, but I have done nearly every hike on the mainland. Old Indian Trail has become one of my favorites, mostly because it’s such a wonderful place to take time to notice all the beautiful trees in the park. 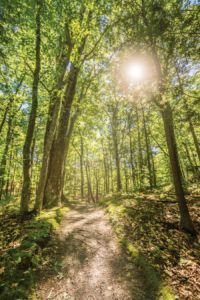 It’s kind of that classic Michigan mix of hardwoods and evergreens, so you get the dark green of the spruce mixed in with the lighter colors of the oaks and sugar maples. When I’m out there, I hike slowly, so I can take my time and notice all the little details: the big “galls” growing on the trees, lichens, fungus, animals that might be perched up in the branches. One of the great things about this hike is that part of the way in, there’s this little spur that goes out to the water. It’s just a short hike up and down these tiny little dunes to the beach, and several times, we’ve had the beach all to ourselves. There are a couple loops you can do, and the longer loop is only about two and a half miles; you don’t have to climb any big hills so it’s not too strenuous. With the combination of the woods and the lake, it’s really the perfect Sunday afternoon hike. Getting there: From M22, look for the trailhead near the west end of Long Lake. My favorite beach had gotten a little busier, so I was looking for a spot that was more secluded, and somebody here at the park suggested I try Lane Road. Lane Road is in the Port Oneida historic district, and some people will venture in around Port Oneida where the roads are paved. But people don’t tend to venture down the dirt roads like Lane Road. Right there you’ll find a small dirt loop parking area and steps that go down to the beach. Over the past two years, the lake levels have been up, and so there really isn’t a lot of beach in many spots. But here, to the right of the steps, there is a pretty sizeable beach and a little sandbar that juts out into the lake. And out in front of you is a super close view of South Manitou Island, and to the north, North Manitou Island. I remember one night we went out there with family for a little bonfire, and we looked around the entire coast—and it was just us. And it was a beautiful sunset—it’s a great area for a sunset. It gives you this completely unobstructed view, and we watched the sun just melt into the water. I thought, ‘Wow, at how many places can I see that?’ There are those moments when you feel like a place is all yours. So it proves that the park has so much to go around, you can still have your own private beach. Getting there: From M22, turn north onto South Port Oneida Road and then left onto South Lane Road. 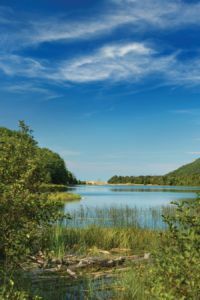 Bass Lake is one of my favorite secluded spots, and it’s not far from the visitor center in Empire. You can park in the small parking area, and after walking down a short trail that’s lined with cedar trees and hemlocks, you’ll see the dock. The lake is completely surrounded by forests and it has really, really clear water. I mean, the water is so clear you can actually see turtles and frogs and fish swimming by, so it’s a great spot for wildlife. Wildflowers grow right down to the banks in the spring, and there are lily pads here in the summer. For a small area, there’s really a lot to do. I’ve gone fishing from the dock, I’ve jumped off the dock, I’ve floated around the lake on an inner tube, I’ve gone stand-up paddle boarding. One of the other great things about Bass Lake is that motors aren’t allowed, so it’s very quiet. You can kayak though, and there’s a little launch there where you can put in your kayak or canoe. There’s also a little ladder at the end of the dock if you want to go for a swim—and it’s usually warmer than Lake Michigan. Probably one of the coolest experiences I’ve had there is when I went down one summer on a really clear, calm night with no wind. The water was so still, the stars were reflecting off the surface of the lake. It looked like there was a second sky on the water. I’m a big fan of the beach, and I love Lake Michigan, but the inland lakes give you a nice change of pace. And if you head for one of the smaller lakes, there’s a pretty good chance you’re going to have it all to yourself. Getting there: From M22, turn southwest onto Bass Lake Drive. You leave the parking lot, and at the start of the trail, you’re in a pretty dense jack pine and cedar forest. You see you have a pretty steep climb ahead of you, but there’s really nothing to indicate what you have waiting for you. Then at the point where you’re about halfway and you stop to take a breather, suddenly, the whole dune plateau opens up in front of you. It seems almost infinite. A lot of the dunes out here are forested, but here, it is rolling dunes, steep cliff-faced dunes, and these huge open bowls of sand called “blowouts” that have been carved out by the wind. 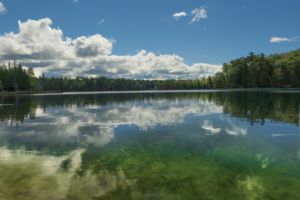 And the water—as you’re looking out into the Manitou Passage or the open lake, it’s a mix of Caribbean blue of the shallows and real dark blue of the deeper water. One of the really incredible features here is the Ghost Forest. These dunes used to be forested. But it’s a dynamic environment, and as the dunes shift and move, they can actually swallow whole forests. The trees are still there, though, and the environment that’s created under all that sand, doesn’t allow—in some cases—for those trees to decompose. Then as time passes, the sand moves out of the area, and now you can see those trees again. So today, there are these weathered, gnarled, gray timbers shooting up out of the sand. You don’t realize it, but they’re hundreds of years old. Compared to 10 years ago, I don’t feel like this spot is a secret anymore. But in the summertime, people are mainly going to the beach. So if you’re up for a hike, it doesn’t take that much effort to get away from folks. Plus, when you’re tired of sweating on the dunes, you can take one of the social trails down to the beach to cool off, swim and beach comb. What’s incredible about this spot is that from Glen Haven all the way down to Empire, you have seven miles of beach. It’s a walk that just doesn’t quit. 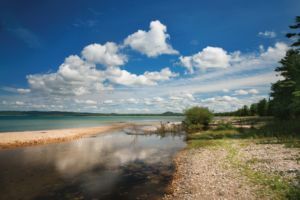 Getting there: From Glen Haven, go west on Sleeping Bear Dunes Road and park at the road’s end. The trail at the Treat Farm is a social trail, meaning it’s not a designated Park Service trail. So we don’t exactly advertise it, and a lot of people don’t know about it. The farm itself is nice, and it does have historic significance: It’s an 1800s farm that was used all the way into a good part of the 1900s. A lot of people stop there, but if you go beyond that, you’ll find yourself in this big meadow. At first it doesn’t seem all that amazing, but as you look to your right, you’ll see a big bluff and a very steep sand trail going up. You can go straight up that for a view of Lake Michigan, but it’s pretty steep. So if you avoid that trail and keep following the foot of the dune, all of sudden it will straighten out and there’s Empire Bluff right in front of you. As far as you can look to the left and right, pretty much all you see is the whole coastline of Lake Michigan. And because of where it’s situated, you don’t even see Empire, so you get this sense that you are in the middle of nowhere and nothing exists out there except nature itself. After that, go north and you’ll see a trail to your right going up along the spine of the dune. But instead of going up that little spine, go out in the sand and you’ll find yourself sitting on top of the dune. Here, if you look around, you get a 360-panorama in all directions. It’s pretty breathtaking. I mean, you go to different places in the park where you’ll have the woods behind you or the lake in front of you. But this is a completely unobstructed view of the valleys, the woods, the cliffs, the sand dune and the lake. And then the way to get down is that sand trail that you avoided on the way in. But it’s a lot more fun going down than going up. Getting there: From M22, turn west onto Norconk Road. Look for the two-track to the right when Norconk takes a sharp left. Lou Blouin is a writer and producer for public radio. He lives in Detroit. lou.blouin@gmail.com. 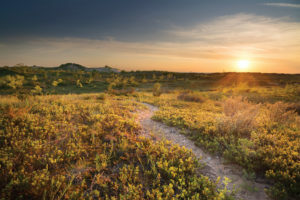 Heather Higham is a landscape & portrait photographer based in beautiful Traverse City. snaphappygal.com. 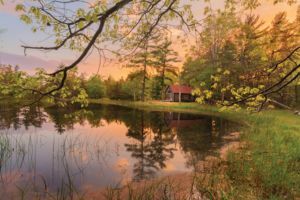 This article is featured in the July 2017 issue of Traverse, Northern Michigan’s Magazine. Get your copy!